A high-end internal refurbishment of an existing 5 bedroom Edwardian terraced villa. Whilst retaining the layout and classic features of the original property, the client has created a clean, simple, contemporary interior, tailor-made to suit a family home. An existing garden room extension was opened up to the kitchen to improve daylight penetration and provide a physical connection, integrating the two spaces. A new bespoke kitchen was designed and fitted to the new space. 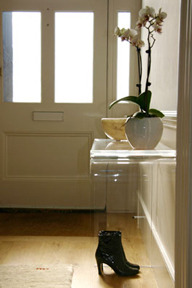 Reception rooms were refurbished and original features repaired or replaced. All bathrooms were upgraded and bedrooms were fitted with built-in bespoke joinery and storage.